Last summer, Hawaiian Electric was in need of a paradigm shift. State utility regulators had just begrudgingly accepted the utility’s five-year power supply plan, but the proceeding — stretching nearly four years — had been a slog. Hawaii regulators had rejected two of the utility’s previous Power Supply Improvement Plans (PSIPs), and specifically did not “approve” the third iteration — only “accepting” it so HECO could take advantage of expiring federal tax breaks for renewable energy. Focus on the PSIP process was intense in a state that has the United States’ highest retail electricity rates, the most rooftop solar installed per capita and the nation’s only 100% renewable energy mandate. Also during the PSIP proceeding, regulators rejected HECO’s high-profile acquisition by Florida-based NextEra Energy that was supposed to provide a cash infusion to help meet the PSIP’s goal. Battered by the planning and merger dockets, HECO executives last year reached out again to Hawaii energy interests, hoping to improve their grid planning model to avoid another contentious proceeding. What they found is stakeholders demanded a new, more comprehensive approach. HECO spent three quarters of last year evolving a new Integrated Grid Plan (IGP) process that included those elements, Ching said, but the plan presented the utility with a new problem. Stakeholders agreed that the PSIP’s four-year proceeding was too long to secure acceptance for a five-year grid plan. But creating an IGP added new issues of cost comparison — particularly between distributed and grid-scale resources — that threatened to stretch the process even longer. HECO’s solution was to “avoid debating the 11 answers,” Ching said, “and just get to the 12th,” using a new, market-based approach to grid planning. Should it win support from regulators in Hawaii, the new approach could combine with emerging practices on the mainland to provide a model to rethink grid planning at vertically integrated utilities. Traditional planning at vertically integrated utilities like HECO is a “very serial process,” Ching told Utility Dive at the Maui Energy Conference last month. Utilities go through a series of forecasting steps, modeling expected electricity demand and cost of different resources. Once those assumptions are approved by regulators, utilities can then go out and issue an RFP to procure the resources they need. The utility spent most of the last year trying to cram new resources into that serial model, Ching said, but some of the theoretical resource values, particularly for DERs, became “very abstract” — just the kind of calculations that often raise questions from stakeholders at the PUC. The HECO team devised new model that removed the theoretical resource cost estimates, replacing them with preliminary RFPs and requests for information (RFIs) that would allow the private market to demonstrate what the actual cost of resources would be during the planning process. The result is that during the planning process, HECO can “actually get what the price of a near term [resource procurement] would be,” Ching said. 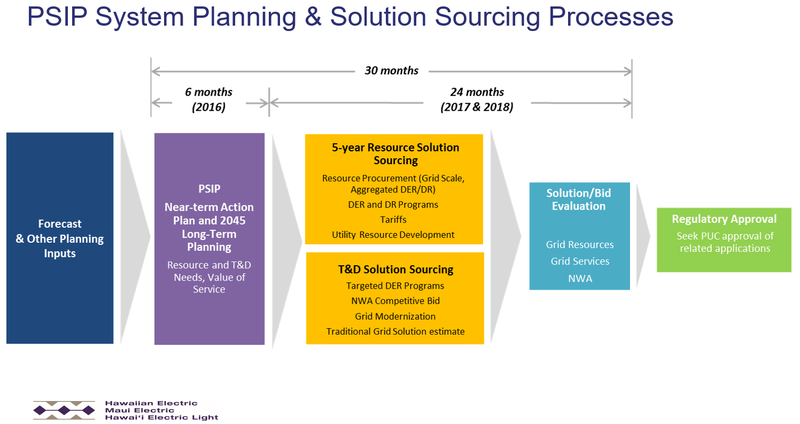 HECO's new IGP process aims to allow for market-based comparisons of resource solutions in the "5yr Resource Solution Sourcing" and "T&D Solution Sourcing" phases. In an RFP, the utility defines a need for the system — such as a local capacity need — and allows private developers to bid in solutions to meet it. That open-ended process is commonly used to procure resources after traditional utility plans are approved, but Ching said its integration into the planning process will allow HECO to better weigh different classes of resources against each other. The new IGP process works for more than just generation, Ching stressed. The utility could also issue an RFP for transmission and distribution solutions, allowing DER providers to potentially defer or replace those costly power line upgrades with batteries or other technologies. By dispensing with cost forecasts, Ching said the IGP approach provides an alternative to complicated DER valuation schemes being devised in states like New York and California. Instead of developing theoretical prices for DERs to compare them with grid-scale resources, an RFP would allow DER providers to compete head-to-head with traditional utility solutions to meet specific system needs. Ching expects the process to save the utility time. 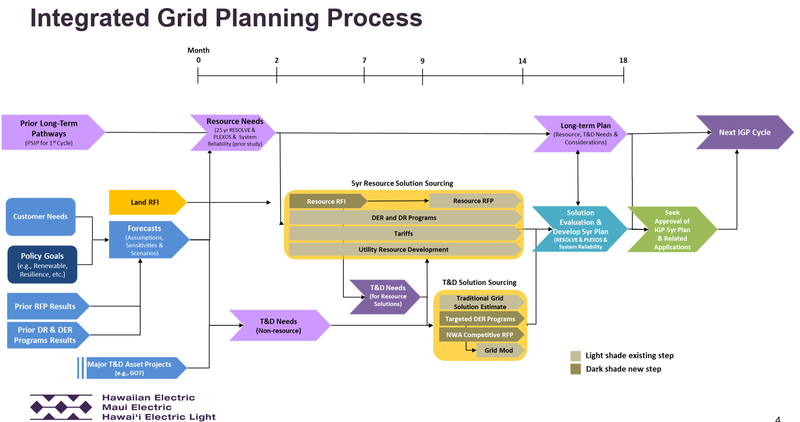 While the original PSIP process envisioned a 30-month planning timeframe, the goal for the IGP process is 18 months. Hawaiian regulators at the Maui conference were tight-lipped about their impressions of the IGP process, but Ching said stakeholders have so far been supportive. Like the Hawaii regulators, clean energy vendors and nonprofits at the Maui conference said it was too early to comment on HECO’s new IGP process, filed at the beginning of March. The process, however, is similar to existing utility practices in Colorado, where regulators in 2010 directed Xcel Energy, the monopoly utility, to consider alternatives to natural gas generation as it retired a number of coal plants surrounding Denver. Those filings evolved into what Xcel calls its Energy Resource Plan (ERP), an integrated resource plan filed every four years that also uses RFPs to compare the values of different resources. The process has two phases, said Ron Lehr, former Chairman of the Colorado Public Service Commission. In the first phase, the utility submits not just a draft RFP, but its draft details for power purchase agreements and its methods for evaluating bids. In the second phase, the utility presents a variety of portfolios to fill its grid needs to the commission, which either approves or adjusts them. “The utility then enters into negotiation with those bidders to make up the portfolio that's approved by the commission,” Lehr said. The Colorado process is unique in that it also directs Xcel to consider the climate impacts of its resource decisions in the planning process, designing portfolios that consider different discount rates for carbon emissions and the social cost of carbon measurement devised by the Obama administration. As the commission evaluates Xcel’s current ERP, filed in 2016, Lehr expects the climate considerations will spur the utility to invest in even more wind. “That’s going to make these very low renewables prices look even better than gas in the bid stack,” he said. Already, Xcel’s ERP process has inspired some eye-popping bids from renewable energy providers. In January, the utility announced one of its preliminary RFPs had delivered wind bids under $20/MWh and wind-plus-storage bids in the mid-$20s. That RFP received more than 400 solicitations, according to Xcel, despite being part of the planning process. That’s encouraging, Lehr noted, because compiling RFP bids is costly and time-consuming for developers, particularly when it’s part of a planning, and not procurement, procedure. As Hawaii moves toward a similar market-based planning model, Lehr said ensuring a transparent, simple process for the RFPs can encourage similar results to Xcel’s last solicitation.To ensure all of the bidding is on the up-and-up, he said regulators should consider making bid information public. “Keep enough confidentiality so bidders are not giving away their secret sauce … however, too much confidentiality means you can’t tell what the hell’s going on and you don't see how they come up with the process,” he said. “A couple of years after the bids are over, all the bid data ought to be made public."